Flying Pigs and Kiawah and Boston and the one in my Ironman race!!! To qualify for Boston again and To qualify for Kona, IM world championship, We need to dream big, right?!!! Running set me free. Truly, I had some self-image issues and such that running helped to heal. I love being outside and being active. I love spending hours with friends along roads chatting and laughing and sharing. I also love running alone and experiencing the wonders of nature. I have too many amazing marathon memories to consider 1 the best!!! My favorite with friends was Flying Pigs bc it was a great Girl trip!! The race is amazing too. 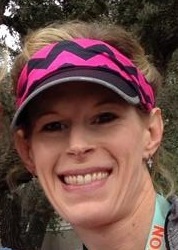 My PR marathon at Kiawah brings big pride as I felt so amazing the whole race and paced myself well. Boston was just the most exhilarating experience so I would love to experience that again. And the Marathon that completed my Ironman was just over-the-top, out-of-this-world The Best!!! The sense of accomplishment I felt running is indescribable. Because it’s a way of giving back to the running community and helping 1 person or many to a goal is a great experience. I have a lot of those too. My first pacing “gig” was phenomenal, I met a precious friend who ran almost the entire race with me to snag herself a new PR. Every race I come home with new friends. The running world is a happy place. If you like positive, uplifting, fun encouragement join me!!! I try my very best to meet the high standards that are set for this pacing team and keep our miles very evenly paced. I like to laugh and enjoy the race while pushing you to victory. Do your homework. That’s what someone told me before my first Ironman. If you have done the training, your homework, you can be successful. Be prepared with the nutrition you need out there on the course might not be what you need when you need it. Run with joy! You can go faster with a smile on your face.